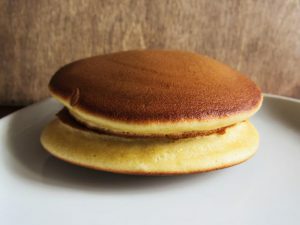 Dorayaki is a sweet Japanese snack that looks like a big round sandwich. 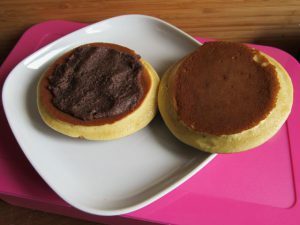 It consists of two very fluffy pancakes with anko paste (sweet red bean paste). These pancakes are a little different from American version. 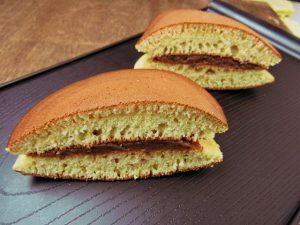 Japanese dorayaki are much more fluffy, almost like sponge cake and contain honey, which gently changes their taste. 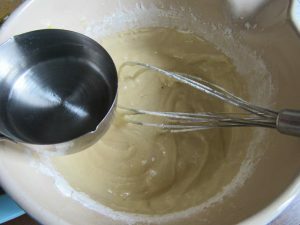 Dough preparation and cooking must be done strictly according to the recipe. The pancakes should be as equal as possible to make them look good when folded. My kids love dorayaki, especially when served with chocolate cream. One big dorayaki will surely satisfy a big sweet hunger. I skipped 1 teaspoon of mirin/sweet sake, because I didn’t have it. 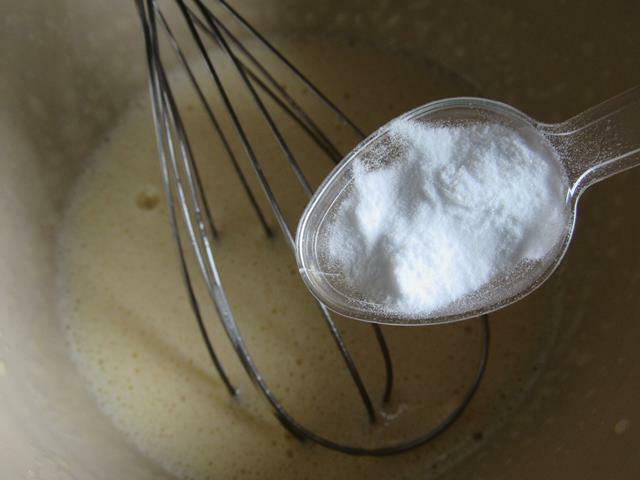 Watch the order and accuracy of adding ingredients. 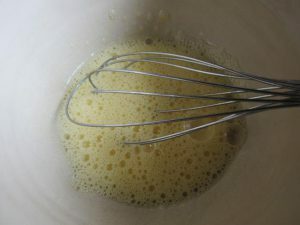 1.Beat the eggs by hand whisker. 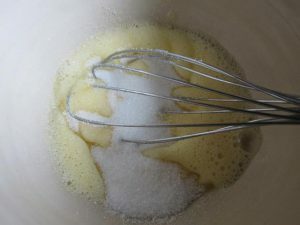 Add sugar and beat until the mixture becomes much brighter and fluffy. 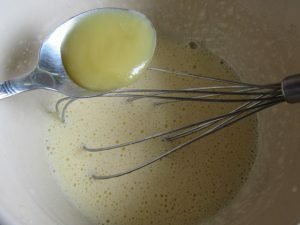 The author of the original recipe doesn’t recommend using the electric mixer, but didn’t say why. 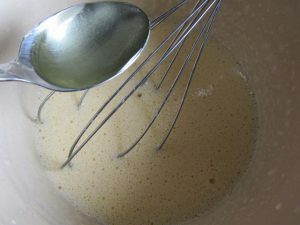 2.Add honey and gently stir, then add the oil, stir, baking soda, stir. 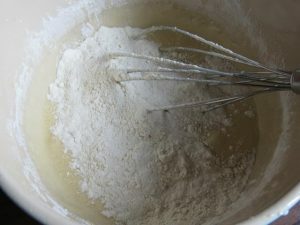 3.Gently add half of the flour, stir and add the rest of the flour, stir well. Finally add water, stir. 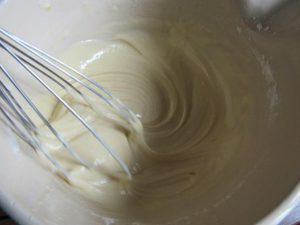 The batter is very dense. I have the impression that more than the usual pancakes cake. 4. Put a little oil on a pan with a kitchen paper. Wipe off excess oil if necessary. 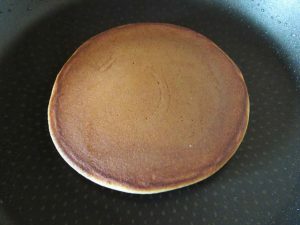 When there is too much oil, pancakes come out uneven in color. Heat the pan on medium heat and reduce to small before pouring the batter. As the heat is too big, the pancakes will burn quickly. To make the pancakes equal, use one measure. That’s important if you want to make nice “sandwiches”. I used ¼ cup and the pancakes came out pretty nice. 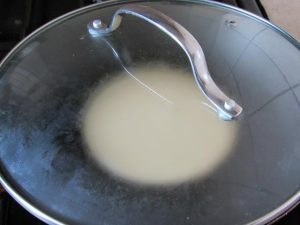 Pour the batter into the center of the pan and immediately cover with a lid. 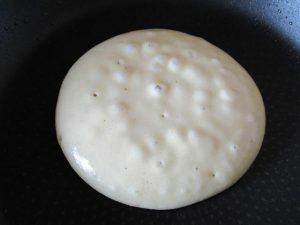 Glass lid is the best, because you can see when little bubbles appear on the surface of the pancake. 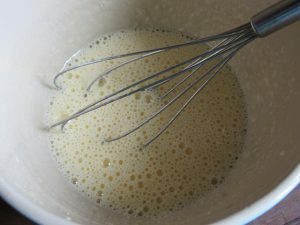 When the bubbles appear (about 2 minutes) turn the pancake over and cook it without the lid for half a minute. Remove from the pan and cook the rest. I got 8 pancakes. 5.Put some anko between two pancakes and serve.